Featuring eight books in one, this All-in-One For Dummies guide covers the key features and tools that you need to know in order to understand how to use each individual program within the Adobe Creative Suite—InDesign, Illustrator, Photoshop, Acrobat, Dreamweaver, Fireworks, and Flash—to its fullest potential. Within the nearly 1,000 pages, you’ll find creative inspiration as well as tips and techniques to sharpen you productivity. 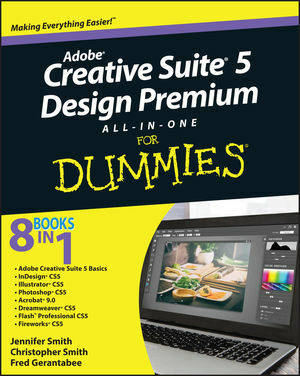 Adobe Creative Suite 5 Design Premium All-in-One For Dummies is a premium resource on all Adobe Creative Suite 5 can do for you. Jennifer Smith, Executive Vice President of the American Graphics Institute, is the author of Photoshop CS5 Digital Classroom and other books. Christopher Smith is an industry expert on electronic publishing software. Fred Gerantabee is an author and Emmy Awardwinning interactive designer and Web developer.